Review: NewAir Ice Maker from Air & Water, Inc.
Air & Water Inc. was nice enough to send us a review unit of their NewAir Portable Ice Maker, model AI-100SS. 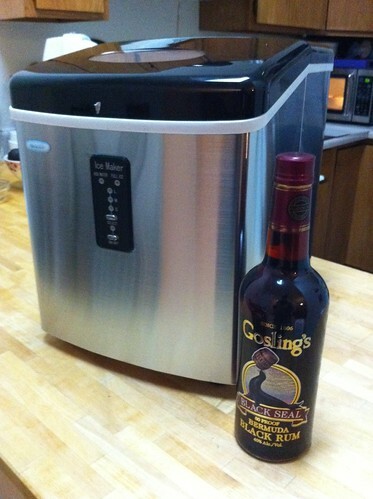 It's a luggable, countertop ice maker that takes water and electricity and outputs ice cubes. Or should we say, ice thimbles. The machine works by chilling nine short rods in a water bath, cold enough that ice forms around the rods. When time's up, the machine ejects the resulting ice into a hopper. The hopper is cleverly positioned over the water reservoir, so as the ice melts, it gets recycled into new ice. We started up the ice maker and let it run for a few hours. It produces nine cubes every 10 minutes or so, making about a pound of ice every hour. The first few sets are pretty anemic; the cubes didn't get to full size until the fourth or fifth set. We tried the ice (on the "large" setting) in a stirred drink, a shaken drink, and as crushed ice. For our stirred drink, we chose the Liberal. (It was appropriate for the evening, since I was sorting through the San Francisco election materials while waiting for the ice.) Here are the results. It's perfectly nice ice. Not particularly big or particularly dry, but better than your average sopping wet party ice. The thimble shape gives the cubes a ton of surface area, so the stirred drink came to temperature pretty fast. For our shaken drink, we chose the Last Word. (We also, by the way, chose CapRock gin for this which makes a fantastic Last Word. Our new go-to for this cocktail). As you can see, the shape of the ice made it break up into tiny pieces almost instantly. The drink was great, without a lot of ice flecks making it through the strainer. We usually like to see bigger pieces post-shake, but the drink didn't suffer. For the crushed-ice drink, we chose the . . . well, never mind. (We didn't have the necessary ingredients for any crushed-ice drink we like.) 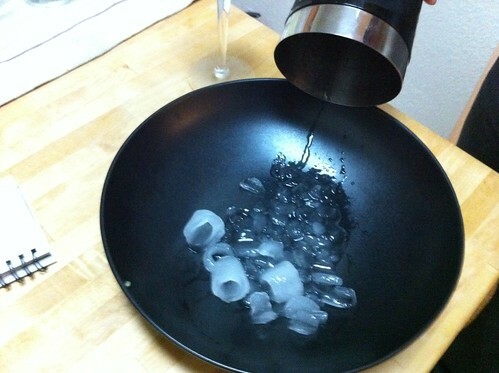 But we crushed the ice anyway, and it turned out perfectly nicely. So, in all, a pretty nice ice maker. Does this have any utility for people with a refrigerator ice maker, or those who like big cubes and use Beaba trays? No, the ice it makes is smaller and wetter than that. While it doesn't make much sense as a kitchen appliance for anyone with a freezer, it can provide a renewable supply of fresh ice anyplace you have electricity. Now you may say we're babying our drinks, but the little dears just love a big 1/4 cup (60ml) ice cube that's been kept free from freezer smells in a lidded tray. Oh sure, Beaba thinks they're selling baby food portion trays, but we cocktail geeks know better, don't we? Beaba multi-portion silicon tray, available in green or orange from Amazon, Williams-Sonoma, and, we'll lay odds, soon some of the cleverer bar tools suppliers.